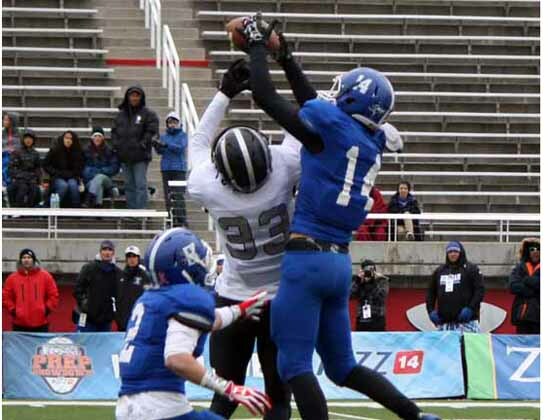 SALT LAKE CITY – All chances of a Bingham vs. Brighton championship rematch in Class 5A football disappeared somewhere around the second quarter of Game 2 of the semifinals Thursday at Rice-Eccles Stadium. As it has done all through the postseason, American Fork put together a strong combination of offense, defense and special teams as the Cavemen pulled away from Brighton to a 58-28 victory that earned them a shot at defending champion Bingham in next Friday’s state final. The Miners gave up an early field goal to Riverton and fell behind briefly, but even without their starting quarterback for most of the contest, they put the game away with a 21-point second quarter, and moved on with a 35-3 win. While Bingham’s powerful defense has had a good year in terms of staying healthy, the same cannot be said for the Miner offense. Tight end Matt Larson was lost very early in the season, and starting receiver Schyler Shoemaker went out soon after that. Senior running back Aaron Marsh went down with a knee injury in Week 1 of the playoffs. All of that was apparently just preparation for the loss that came down in the second quarter Thursday. Quarterback Kyle Gearig has been the focal point of the Bingham offense the last two years, so when he went down with a dislocated elbow early in the second quarter of a 7-3 game, it did not look good for the Miners. Then again, not much fazes the Bingham defense, which has held solid all year as the offense gained experience behind just two returning starters. A year ago, Gearig suffered a concussion just before intermission of the state title game, so the Miners have done this before. This time, the defense stepped up as usual, and slammed the door on Riverton, but the game ball goes to back-up quarterback Ben Boelter, a senior left-hander who stepped in under center and proved he is very ready to sling it. Boelter threw a 29-yard touchdown pass to Michael Green right after coming into the contest and hit Cameron Smith for a scoring toss that covered 52 yards less than three minutes later, and the rout was on. In total, Boelter completed 10-of-12 passes for 218 yards and three touchdowns in relief of Gearig. The question that remains is – can he do it next week after knowing all week that he will be the man? When you’re playing this talented Bingham team, you know the Miners will finish strong. Your best bet is to grab momentum early and find a way to battle through. If they get your early, you may never have a chance to respond. Riverton got off to the kind of start you look dream of, as the Silverwolves rode a 67-yard run by Keaton Kimball deep into Miner territory on the game’s opening possession. That’s when the Bingham defense stepped up to make the plays that may have determined the outcome of the game, even at that early point. First, the Miners turned up the defense and shut down the Riverton advance right there, forcing the Silverwolves to settle for a field goal. Then, after Bingham chewed up more than six minutes on a touchdown drive to take a 7-3 lead, Riverton got to work again and drove 42 yards to the Miners’ 38. Then, Ethan Erickson went high in the air to steal a pass from Riverton’s Cayden Jones. The interception set Bingham up for an eight-play 77-yard drive that ended with the first of those Boelter TD tosses. Daniel Langi picked off a pass on the next Silverwolf possession and Boelter and company turned that one into seven points in less than a minute, and with 4:54 left in the half, it was 21-3. After Riverton turned it over on downs and the Miners picked up one last score just before the break, the teams were headed to the final 24 minutes and Bingham had a 25-point margin. 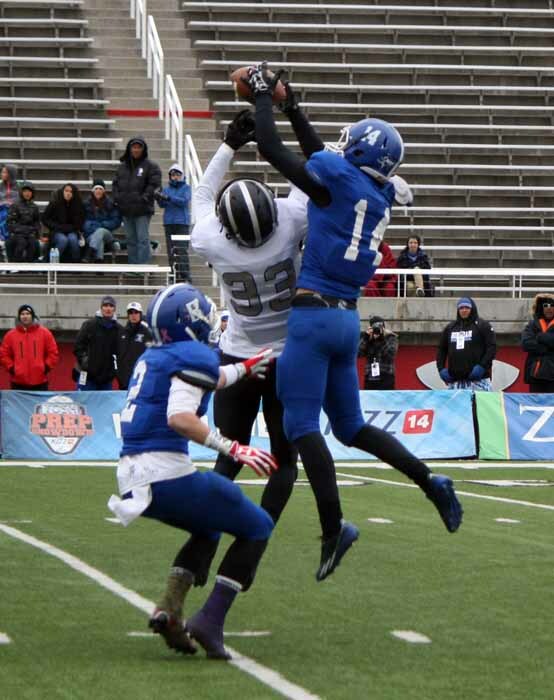 The Bingham defense turned things up to a whole new level after the Gearig injury. After Riverton picked up 72 yards on its opening drive, and another 42 on its second possession, the next seven opportunities yielded just 108 yards on 32 plays. While the Miner offense was taking advantage of each chance to score touchdowns, the defense was its usual dominating self, and Bingham is moving on. It was bad enough that things were headed south for Brighton heading into intermission of its state semifinal battle with American Fork. The Cavemen went to the break having scored the final 21 points of the first half to turn a 14-14 deadlock into a 35-14 advantage. Then, Coleson Worley emphatically delivered the message that there was not going to be a changing of fortunes. The 5-foot-11, 175- pound junior took the second half-opening kickoff 88 yards to the house and the margin was suddenly 28 points. There were turnovers both ways in this one, and even defensive scores, but by the time it was all finished, the 38-yard pick-six by Brighton’s Cody Barton that tied the game at 14-14 with 3:43 left in the opening quarter, was the Bengals only takeaway. 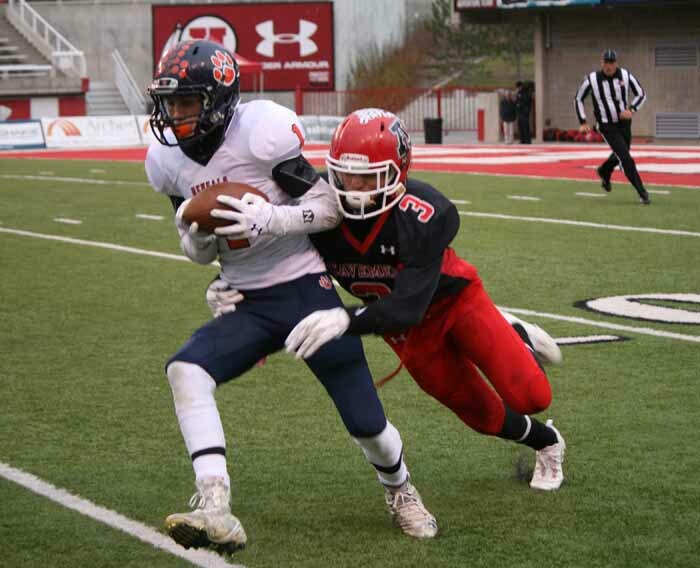 American Fork countered with seven, and that was way too many for Brighton to overcome. It started on the second play of the game, when Ben Cummings intercepted Bengal quarterback Robbie Hutchins and took the ball back to the Brighton 6-yard-line. Zach Katoa ran it in from there to put the Cavemen on top early. Brighton scored on its next chance, but at the 8:26 mark of the quarter, Cummings turned up again, this time picking off a Hutchins pass and taking it to the end zone to put American Fork back on top by a touchdown. Barton’s defensive touchdown followed that , but from that point on, it was a story of Bengal turnovers and 38 unanswered points for the Cavemen, who built a 52-14 lead by the end of the third period. A look at the offensive statistics do not tell the story of a 30-point blowout, as American Fork had just 321 yards of offense (compared to 310 for the Bengals). In fact, the usually potent Caveman passing attack did not get things going much in this contest, but American Fork did not need it. With all of those turnovers, and with a growing lead on the scoreboard, coach Aaron Behm and the Cavemen put the game in the hands of running back Zach Katoa. The 6-1, 190-pound senior averaged nearly 10 yards per carry as he ran for 184 yards on 20 runs, far out-gaining the high-profile running backs on the opposite sideline – Osa Masina and Sione Heimuli-Lund, who were limited as Brighton took to the air in an attempt to come from behind. Hutchins threw five interceptions along the way, but Brighton’s senior quarterback also passed for 291 yards in the game, most of them coming on connections with 6-4 junior receiver Simi Fehoko, who was the offensive star on a tough afternoon for the Bengals. Fehoko caught nine passes for 175 yards and a pair of touchdowns.